The Red Thunder Airshow is held at Watts Bridge Memorial Airfield. The airfield features three well formed grass runways suitable for almost all types of recreational aircraft. Watts has been used by aircraft such as the P51 Mustang, L-39 Albatros, Yak-3U, Trojan T28, Antonov, Lancair, Pitts Special plus a variety of vintage, warbird, ultralight, glider and general aviation aircraft. (See below for Runway Details) Watts Bridge Memorial Airfield is OCTA being situated on the boundary between Brisbane International Airport’s CLASS C Lower Limit of 7,500′ and the CLass E Lower Limit at 8,500′ making for recreational and glider friendly operations. CTAF Procedures (3 NM Radius – Surface to 3000 Ft AMSL) apply for all operations at Watts Bridge Memorial Airfield. 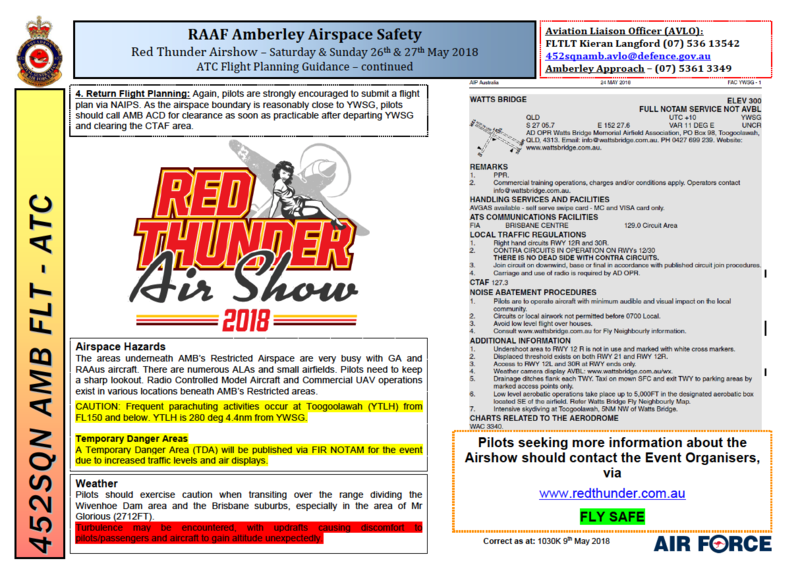 Watts Bridge Memorial Airfield and the organisers of Red Thunder Airshow are strongly committed to a “Fly Neighbourly” policy ensuring good working relationships with other land owners in the district. 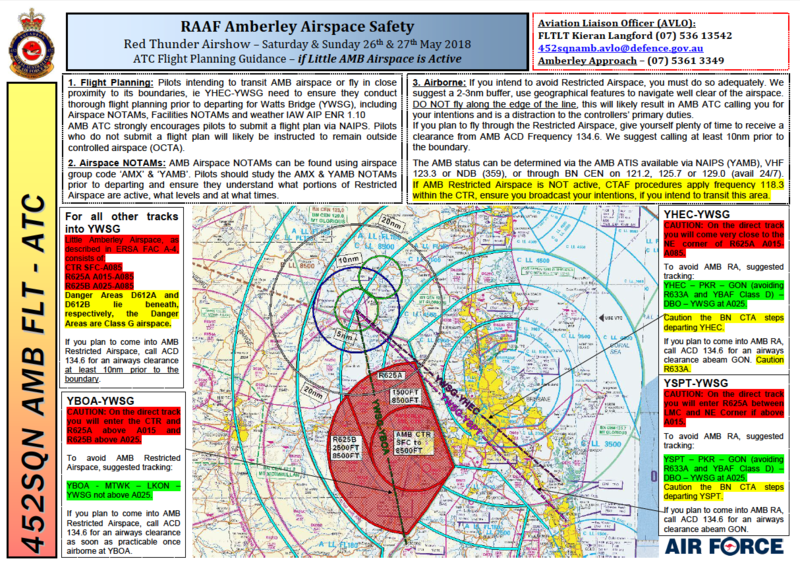 Pilots are requested to download the Fly Neighbourly Chart to be aware of and avoid where operationally possible, noise and over-fly sensitive locations adjacent to the airfield. During The Red Thunder Airshow Watts Bridge Unicom will operate on CTAF 127.30. “Watts Unicom” is a traffic advisory service only and will not be responsible for the separation of aircraft. Pilots are reminded that they are responsible for there own visual separation at all times when operating with in the YWSG airspace. Unicom will be available for weather, traffic advisory and parking directions during the following times. All times are given in Australian Eastern Standard Time. At all other times Silverleaves Road (Final approach to Runway 12R) is fenced and runway 12R/30L revert to 900m. Circuit directions are contra. i.e If you landing on a runway designated ""R then that runway is a right hand circuit. Aviators are strongly advised to prepare for arrival, understand all local procedures, make regular radio calls, be aware of FIR NOTAMS that will close airspace, and head CAUTION on arrival and departure due to a large amount of traffic. Click here for specific airfield details. This information is supplied for general reference only and is NOT to be used for operational purposes. Consult ERSA, current VTC’s NOTAMS and/or contact the Airfield Management for current airfield details prior to conducting operations at Watts Bridge Memorial Airfield. WARNING: Watts Bridge YWSG airspace will become a Temporary Danger Area (TDA) on Friday the 25th May 2018 through to Sunday the 27th May 2018. The airspace will be open to general aviation arrivals and departures at set times. During air displays on the Saturday and Sunday YSWG will be closed to ALL traffic. Pilots are reminded to check NOTAMS and communicate on VHF before entering YSWG airspace. WARNING: VHF Radio is a Mandatory requirement at Watts Bridge. The general public will not be allowed to walk among visiting aircraft. Arriving aircraft will NOT be subject to a landing fee, however all occupants will be required to purchase an airshow pass. Click here to purchase now. Security patrols will be in force 24/7 at Watts Bridge for airfield, aircraft and patron safety. Camping is only permitted in the allocated camping areas and normal fees will apply. Click here to purchase now. AVGAS is available at the airfield and can be paid by credit card. CAUTION: Air Display Practice. Arriving aircraft may be restricted. Carry additional fuel for possible traffic holding.